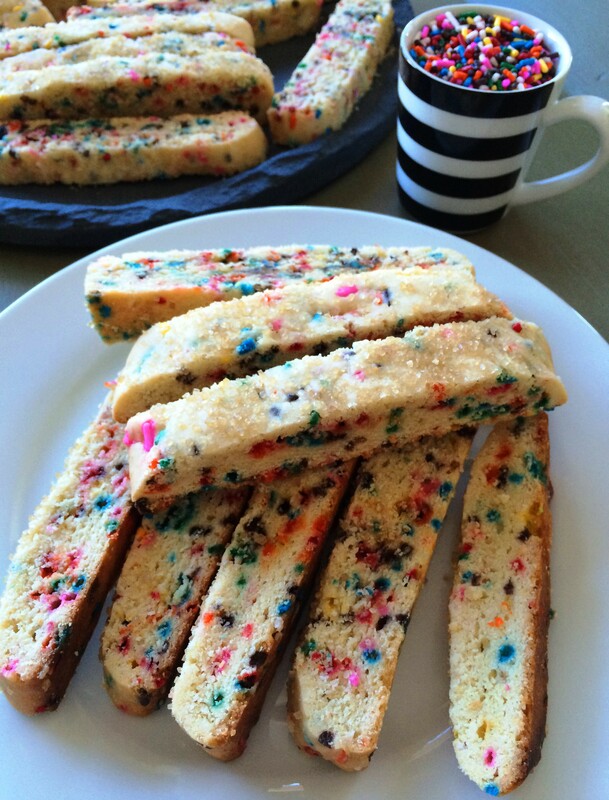 I’m a little embarrassed about these biscotti. 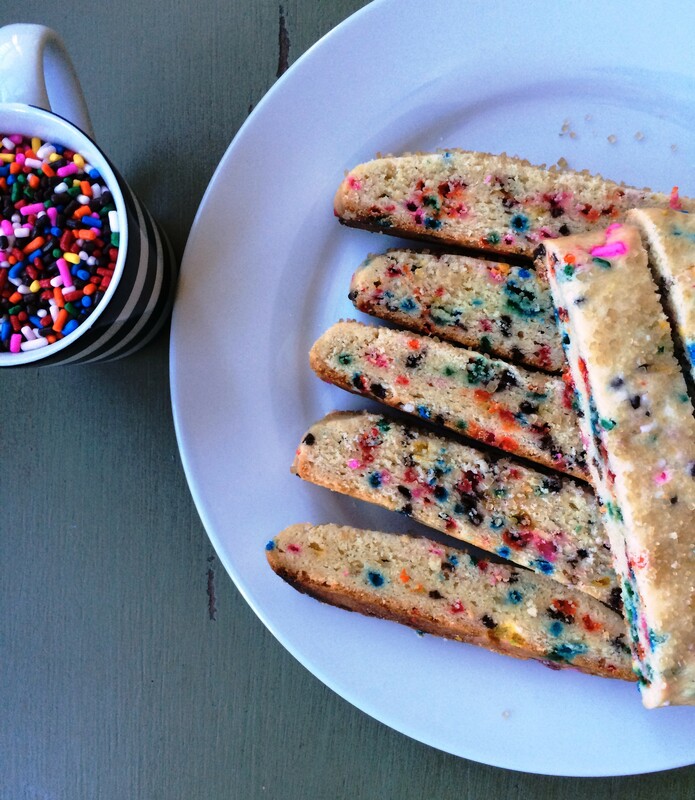 I mean funfetti has never been my jam. I’m not eleven. I’m not really into flavorless, dye-filled, sprinkles that bring nothing to the party in terms of taste. But… they’re so cute. I mean the cutest. And they are addicting to eat. And they are kind of a mature, funfetti format right? 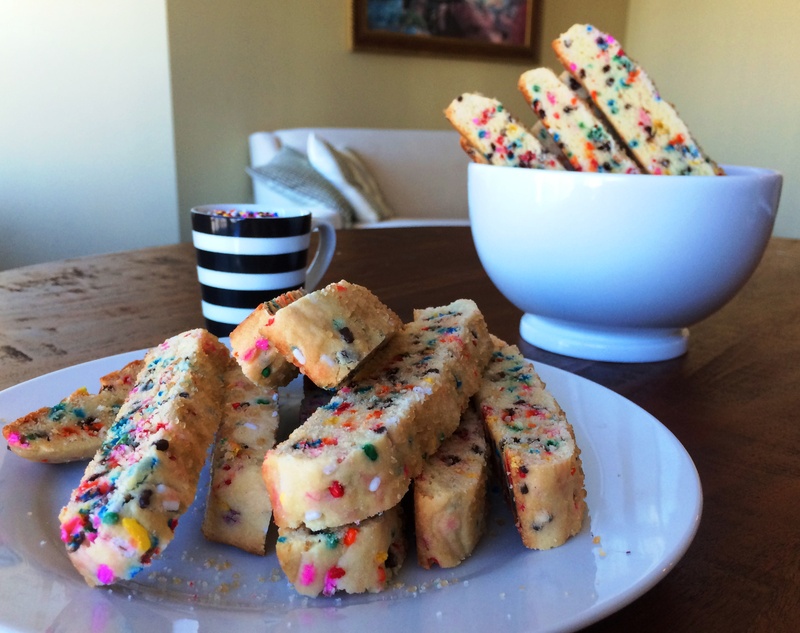 Biscotti. 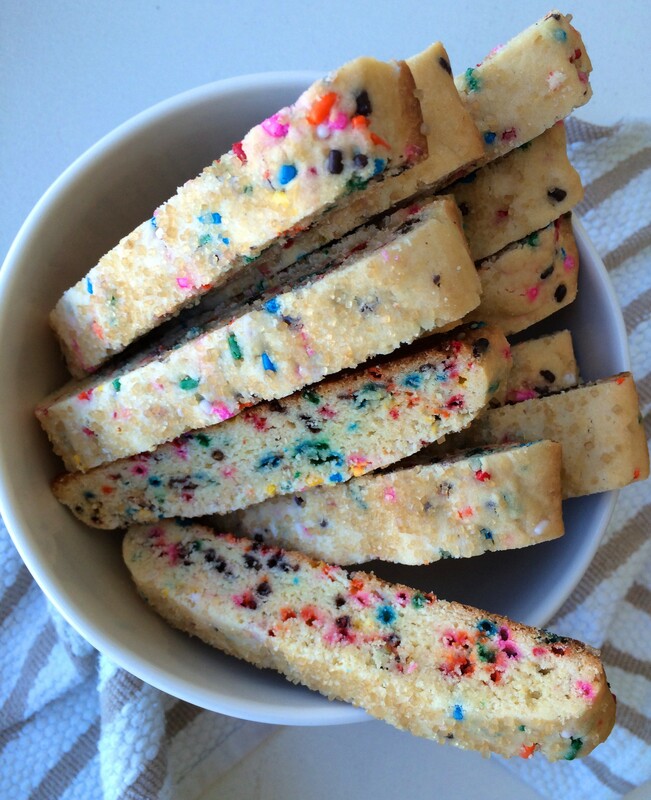 Grown-up funfetti snack. I giggled the entire time I made these. I kept looking up thinking- when are my friends getting here? I forgot to get balloons! What kind of presents am I going to get? These pictures don’t do justice to how precious these are… the sprinkles are so happy and the raw sugar on top is like glitter. Teeheehee. Not sorry. Preheat oven to 350 degrees F. In a large bowl whisk together oil and sugar. Whisk in eggs one at a time, then vanilla. In a medium bowl whisk together flour, baking powder and salt. Whisk dry ingredients into wet ingredients. 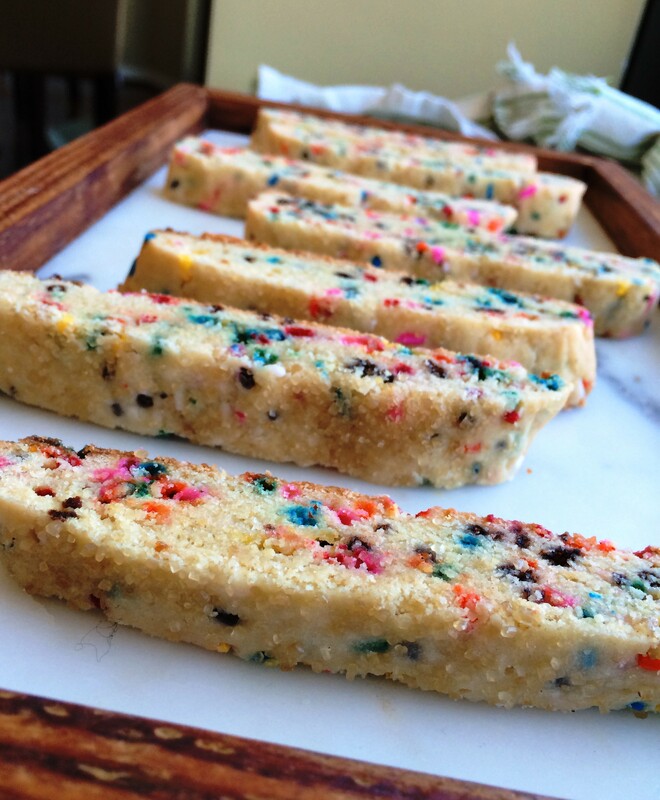 Fold in sprinkles. Giggle at how cute the dough looks. Line two baking sheets with parchment paper. Divide the dough into two equal parts, form into long rectangles, about 4 inches wide and place one on each baking sheet. Top with the sugar and bake for 25 minutes. 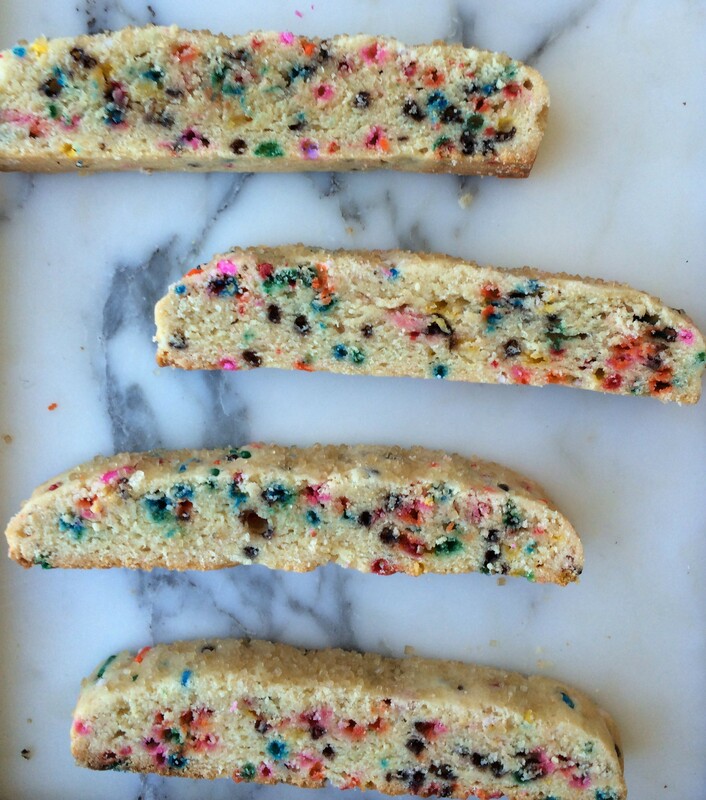 Remove from the oven and reduce heat to 250 degrees F. Using a serrated knife slice the dough into one inch biscotti and place them on their side. Bake for 20 minutes.